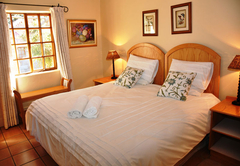 St Fort Country House is one of the highly recommended Clarens guest houses and provides accommodation in 6 guest rooms for tourists visiting the Thabo Mofutsanyana region. 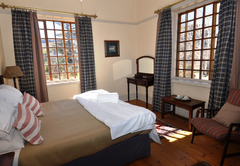 At St Fort Country House you will experience Eastern Free State hospitality at its finest. 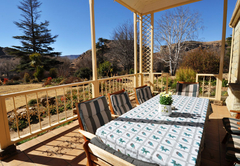 The farm is situated 5kms from picturesque Clarens, on 2,200 ha of land in a stunning setting surrounded by the foothills of the Maluti Mountains. 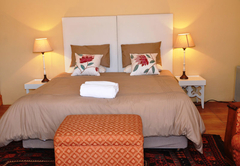 St Fort Clarens Country House is a sandstone homestead which offers the finest in quality farm accommodation with six en-suite luxury bedrooms and the option of breakfast or self catering. 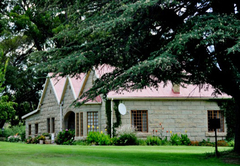 Antique furniture, DStv, a spacious kitchen with under-floor heating, and a lounge with log fire, are what make this holiday destination truly unique in this area. 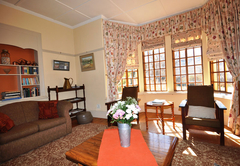 Some families prefer to book the whole house for their enjoyment. Stunning outdoor chapel facilities are available and services at the St Fort Bush Chapel can be arranged inclusive of the venue hire. St Fort has wonderful inhouse caterers. We look forward to preparing your favourite dishes for your special day. 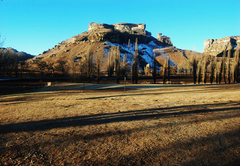 Clarens weddings are unforgettable. 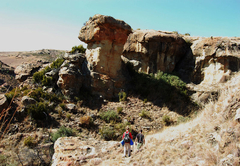 For those who love to explore, St Fort offers four expertly laid out hiking trails, namely the two day Cannibal Hiking Trail which caters for the keen and more adventurous hiker. 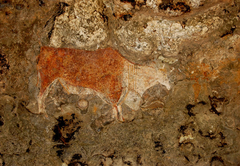 It includes a night spent in a cave, complete with historic rock art. For a brisk morning or afternoon walk, we offer three shorter trails. 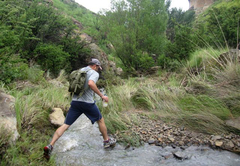 All these trails take you through differing landscapes, from breathtaking mountain views, overhang caves, to river walks with numerous picnic spots, forest ambles and boulder hopping in and along gorges. 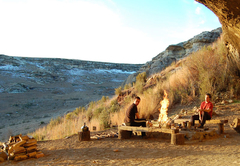 The trails are well marked and provide all the amenities a hiker demands, from comfortable bedding, ablution with flush toilets and hot showers as well as a reed enclosure with braai facilities. Other activities include bird watching. At least 50 different species of birds have been spotted on the farm. Bring your own bike and enjoy the freedom of riding around on the farm. 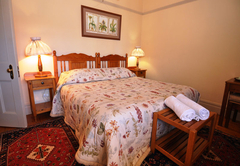 Room consists of a king size bed with a fireplace. 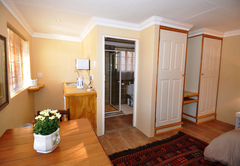 The en-suite bathroom has a bath, shower and bidet, full kitchen, patio, sitting area. King size beds. Extra length. Electric blankets. Room 1 has a fire place. 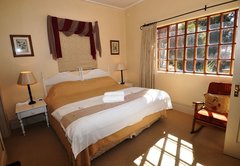 Double room with king size bed (extra lenght). En suite. 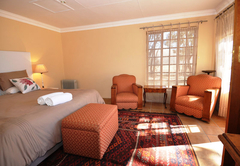 The 2 rooms in the family unit are en suite and consist of king beds (extra length) and the unit also has a lounge and kitchenette with a little stoep in front. This unit has an own entrance. 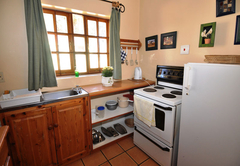 The garden cottage is private with a king size bed (extra length), little kitchenette and bathroom with a shower and bath combination. 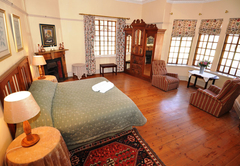 Our family of four (two teenagers) loved the St Fort Country House! We were lucky enough to be there during the down season and had the place to ourselves. The home was lovely, we especially loved the cozy living room and fire stove. Ernestine (the owner) and Sylvia served us a marvelous breakfast every morning in the dining room. Ernestine was wonderful, answering all our questions and giving us hiking tips. Sylvia was warm and friendly. We could see how hard all the staff worked on the grounds of the country house! Speaking of hiking, there are some wonderful hikes starting at the property. I highly recommend them. And about the property itself, they hold weddings here and I can see why. 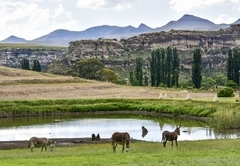 The grounds are beautiful - spongy grass, flower gardens, whimsical photo spots, rabbits, wild birds, a donkey, sheep, white ducks, picturesque buildings - surrounded by the beautiful foothills. And a pond too! I will always remember this place and dream of coming back. My only suggestion is that the room we slept in needs a better wall heater. It was freezing until I warmed up under the plentiful covers. Ons het baie lekker heer gekuier!! Ons book weer vir volgende vakansie! Response timeSt Fort Country House typically responds to requests in 5-10 minutes.